A game by Pixel Barrage Entertainment for PC, Mac, and Linux, originally released in 2015. Adventure in the Tower of Flight begins with a telling of its history. Long ago, there were five kingdoms, each of which possessed a powerful relic gifted to them from the gods. However, the kings of each land were not satisfied with what they had, and chose to invade the other kingdoms in hopes of winning all of the relics for themselves and claiming ultimate power. 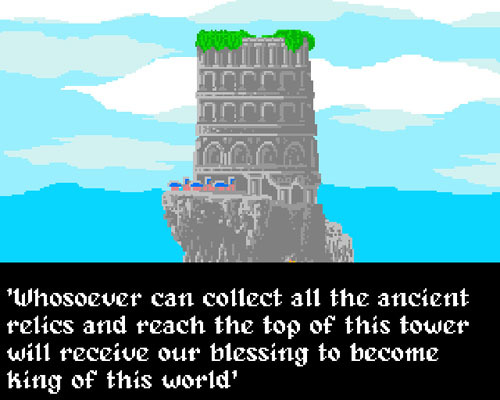 Angered by humanity’s greed and lust for power, the gods round up all of the artifacts and place them within a gigantic tower, declaring that whomever is able to ascend the tower, overcome its challenges, and collect them all will become ruler of the world. Generations have passed and no one has yet been able to make the ascent. Knights continue to arrive from all over the world, hoping to claim ultimate power for themselves… but none of them have ever returned. As the game begins, a young boy named Wing stands before the tower, armed with only a short sword and a helmet that allows him to fly. No explanation is given for why he seeks out the relics, and many of the nearby NPC’s suggest that he is a fool for even making the attempt. Nevertheless, he presses forward. Wing does not have a traditional jump; rather, he is able to fly high into the sky. 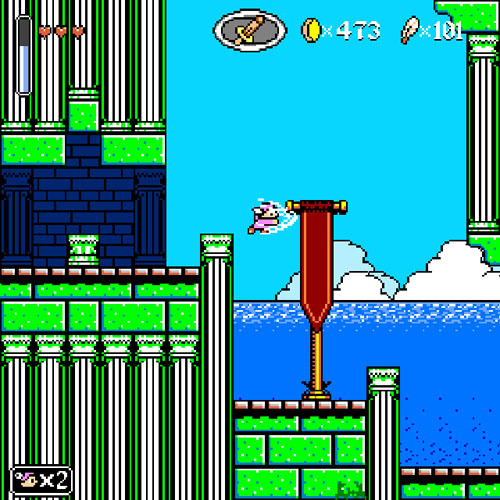 A meter appears in the upper left corner of the screen and drains slowly as he ascends, although it refills when the player lets off of the button, allowing for near-continuous horizontal flight over long distances with the proper button timing. When the meter runs out, Wing falls back toward the ground, and the meter fills very quickly when he is standing on a solid surface. Wing’s only offensive ability at the start of the game is a short-range sword attack, which requires him to get very close to his enemies, many of which take multiple hits to kill, although most are fairly slow. 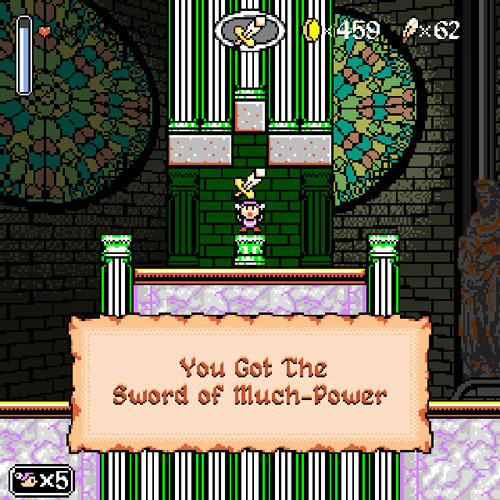 By pressing DOWN and ATTACK, Wing swings his sword lower, allowing him to hit enemies on lower platforms. Wing can also swim freely and stay underwater as long as he likes. Swimming also drains his flight meter, but this occurs more slowly than during actual flight. 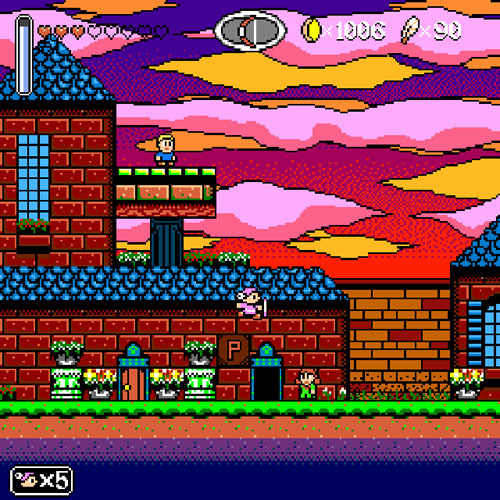 The player begins the game with only three hearts and three lives, although additional hearts may be discovered by thoroughly exploring the environment, and extra lives may be purchased. 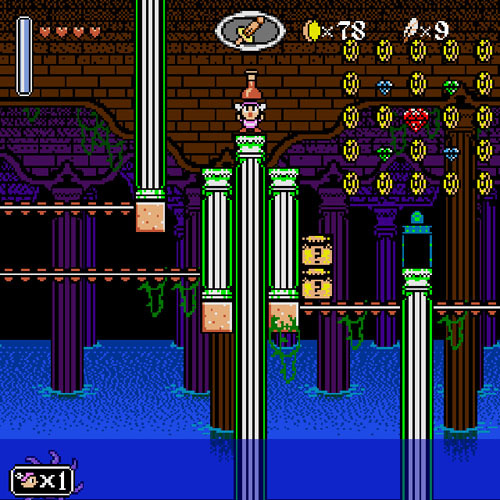 Killed enemies frequently drop a heart or a coin, with hearts restoring a single unit of health and coins adding to the player's stock of currency. 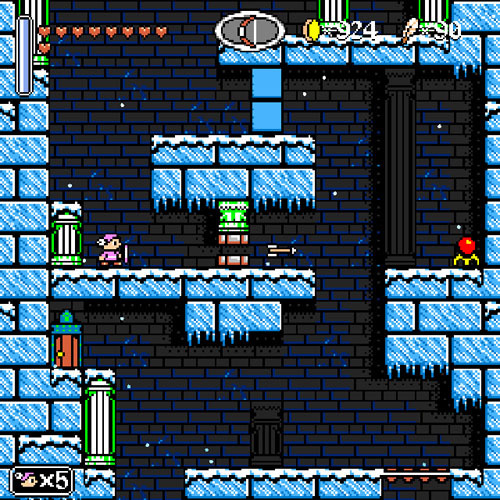 Checkpoints appear infrequently, so it is imperative that players stock up on 1UPs to avoid replaying large sections... although the game’s difficulty is generally quite low. 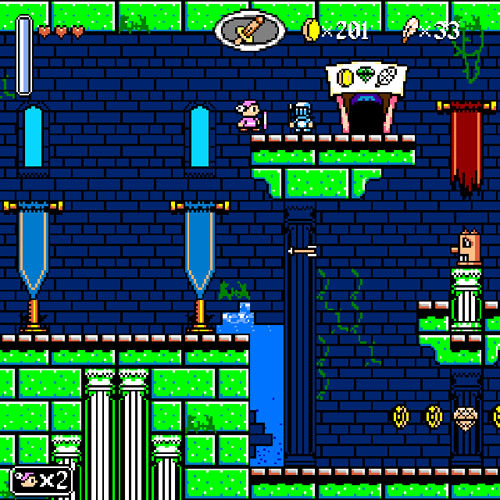 The tower is positively packed with treasure, with coins and gems distributed liberally around the environment and hidden behind secret breakable walls, and piles of gems spilling out when defeating powerful enemies. A secondary currency exists as well, in the form of feathers, which may only be found by breaking open pots and destroying blocks. There is plenty of treasure to be found... the only trouble is that there aren’t many useful ways to spend it. 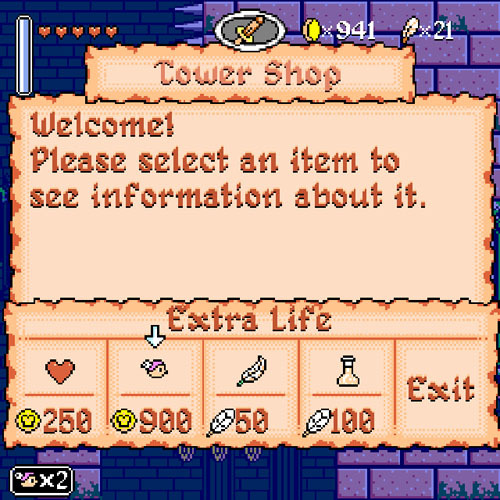 Shops appear periodically (apparently, merchants have no difficulty ascending the tower), but there are only a few possible purchases, many of which aren’t terribly beneficial. The most useful item in the shop is the high-priced potion bottle (900 coins) which increases Wing’s life bar by one heart. Once this purchase is made, the item is replaced with a 1UP on all future visits. Life extending potion bottles are otherwise only found through exploration. The only other item that can be purchased with coins is a full health restoration, at a cost of 250 coins. 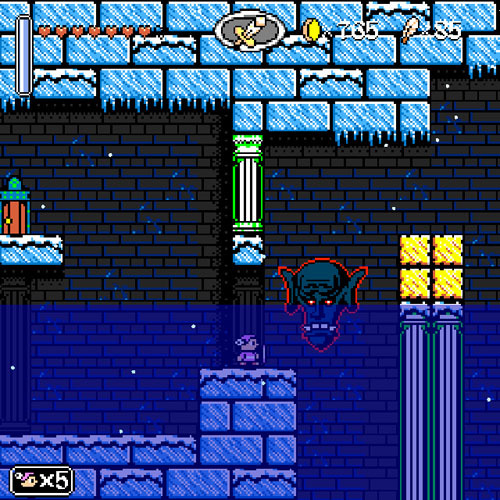 Given the frequency of health restorative drops, and the fact that enemies respawn when the screen scrolls, it is generally easy for the player to pick off a few weaker enemies to regain health. Players may also use this tactic to farm for coins and gems, especially in areas that have large enemies that drop lots of high-value gems when killed. Other items in the shop may only be purchased by spending feathers, and feathers do not appear as enemy drops; they may only be found by exploring the environment. 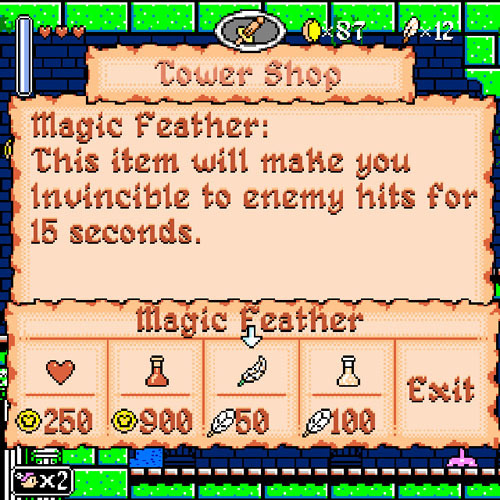 One of the purchasable items is a magic feather that grants the player 15 seconds of invincibility at a cost of 50 feathers. The problem with this item is that it activates the instant the player leaves the shop, running for 15 seconds and then turning off, rather than being player-controlled. Another item is a potion bottle that instantly restores the player’s health to full when he is killed. This item is most useful during boss encounters, as it restores the player’s life on the spot, whereas getting killed returns the player to the last doorway he entered (unless he runs out of lives, in which case he spawns at the last checkpoint). Generally speaking, there is more treasure to be collected than there are enemies to kill – and moving off the beaten path is generally rewarded with more treasure. But with 1UPs and health restoration potions acting as the only beneficial purchases… the player is simply making it easier to stay alive longer so that he may collect more treasure to make more of these purchases. 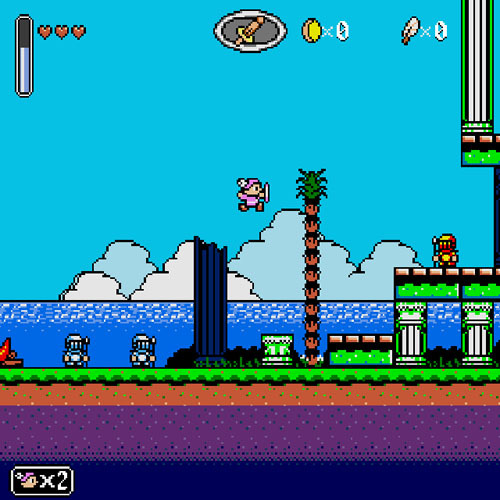 The game’s flight-based mechanics mean that players can move freely in any direction, and this design is supported with a square aspect ratio instead of the traditional rectangular widescreen. Many areas are designed with a great deal of verticality, sending the player to great heights and depths in order to move forward. The game alternates between linear progression through a series of doors, and nonlinear exploration. Sometimes, additional exploration is optional and left to the player, and other times the player is left with multiple routes and must figure things out on his own. 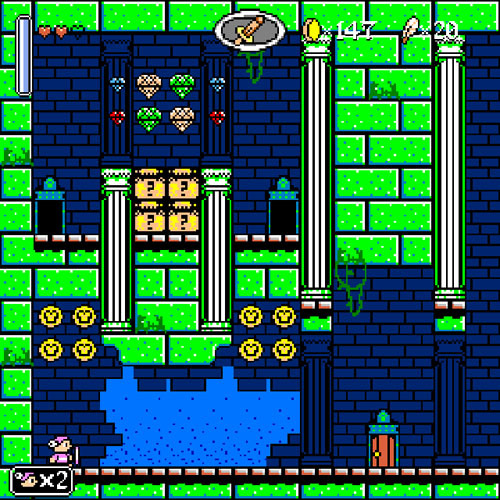 Often, the player must hunt the environment for a key, which may then be used to open a lock and move forward. In nonlinear areas, the player may search all of the available rooms for a key, and then seek out the lock, whereas linear areas actually loop back in on themselves, returning the player to a previously-explored area when the key is found. Exploration is made more difficult by the presence of numerous 1-way platforms and the fact that doors always close and lock behind Wing when he passes through them, making it impossible to backtrack directly. Often, there is no way for the player to tell which doorway is the most beneficial, and he may cost himself a life extension if he chooses the wrong one. Moving from one area of the tower to another blocks off everything in the prior area, and a map is presented showing the basic layout of the next section. Wing gains strength and earns new abilities by discovering each of the five relics, which are spread evenly throughout the tower. The first of these relics are the Boots of Much-Flight, which grants Wing a dash move which can be executed in four directions, at the cost of draining half of the flight meter with each use. This new ability allows Wing to break gold blocks that are impervious to his sword attacks (and don’t appear in the game until he earns the ability to break them), and he can now break blocks above him. The maneuver can also be used against enemies, doubling Wing’s attack power and letting him take down stronger foes and aerial enemies much more easily. This is balanced by a short cooldown period after connecting with a dash where Wing cannot attack, and draining the flight meter makes it harder to stay aloft. Next up is the Sword of Much-Power, which grants Wing a stronger basic attack, and an even stronger air dash attack. Holding the ATTACK button also charges up the sword for a stronger blow that has a longer reach, and this is the only attack that can be used to defeat armored enemies. Armored foes move slowly and don’t pose much of a threat, but the upgraded sword allows players to clear them away. Hitting them with a charged attack flips them onto their backs, and players can follow up with a regular attack to kill them. 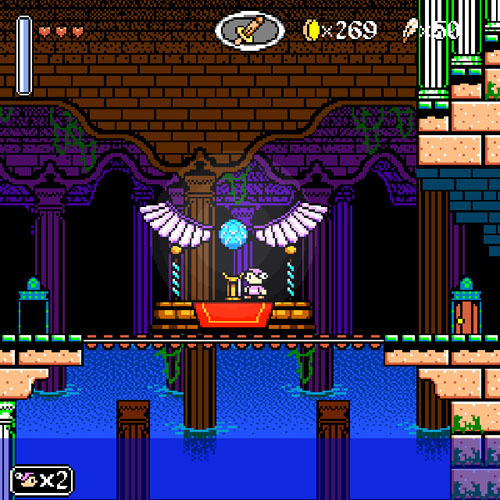 The Bow of Much-Reach allows Wing to fire arrows to the left or right, and the player can alternate between using arrows and his sword. Arrows are weaker than the sword, but they have the added benefit of hitting enemies at a distance and penetrating multiple foes simultaneously, making them great for taking out a line of baddies. 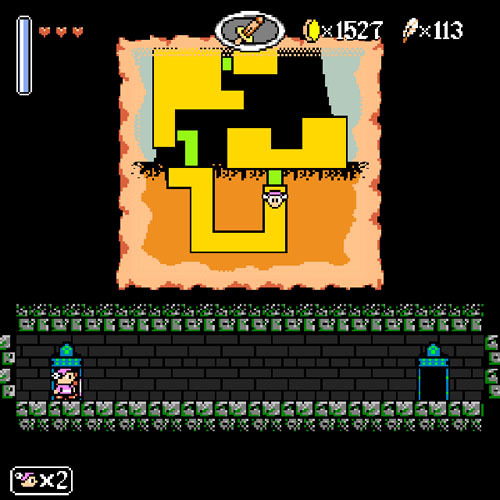 There are also a number of simple colored switch puzzles in the back half of the game that require the use of arrows to complete. These switches change between red, blue, and green, making blocks of the corresponding colors disappear. The last two relics are defensive in nature and don’t do much to alter the basic gameplay, aside from making things a bit easier on the player. 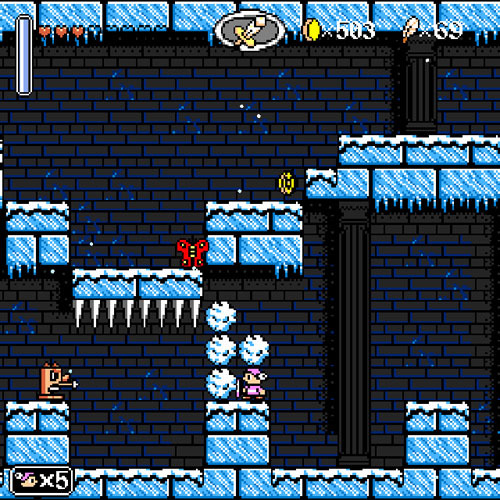 Most enemies move slowly and follow basic patrol routes, presenting little immediate threat to the player. Some stronger enemies are capable of draining the Wing’s health quickly, but their movements remain fairly predictable. 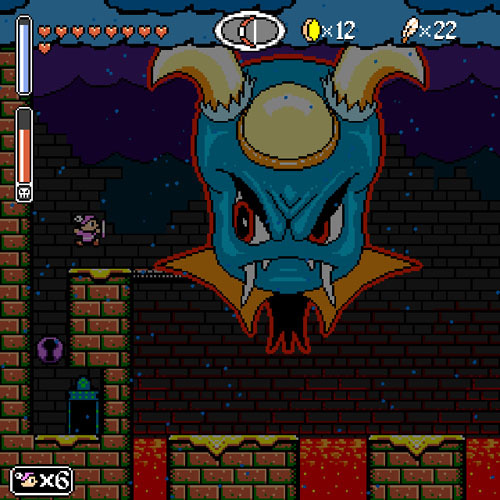 Given Wing’s slow movement speed, the toughest foes are the ones that move quickly, such as fireballs emerging from lava, green penguin-like enemies, and some very annoying bat-like creatures that can pass through solid objects. 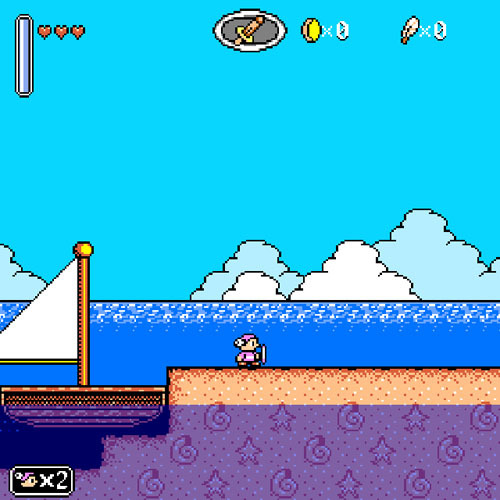 There are some wooden enemies that fire fast-moving arrows, but the player can knock these arrows out of the sky with his sword… and later with arrows of his own. Bosses pose the biggest challenge as they tend to be large mobile targets that take off a sizeable chunk of Wing’s health when they make contact. One of the more interesting encounters is the first boss. 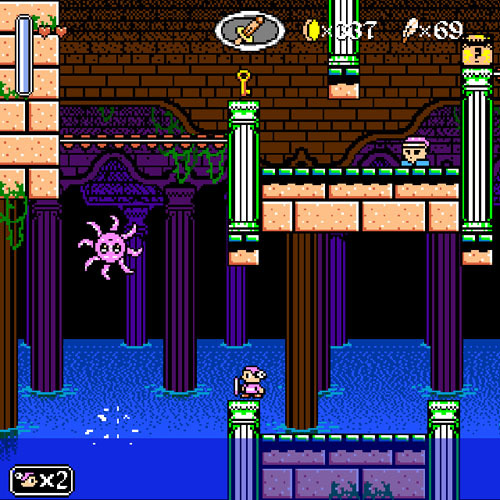 In the level preceding the boss, the player passes through an underwater section and sees what appears to be a maiden in the background. However, the maiden is later shown to be the glowing light on the head of a giant angler fish. 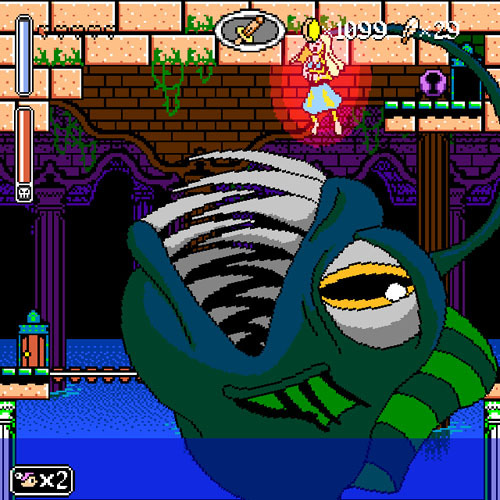 Following this, the fish chases Wing through the environment in a short escape sequence, followed by a proper boss fight where the fish descends into the water and occasionally exposes the maiden above the surface. 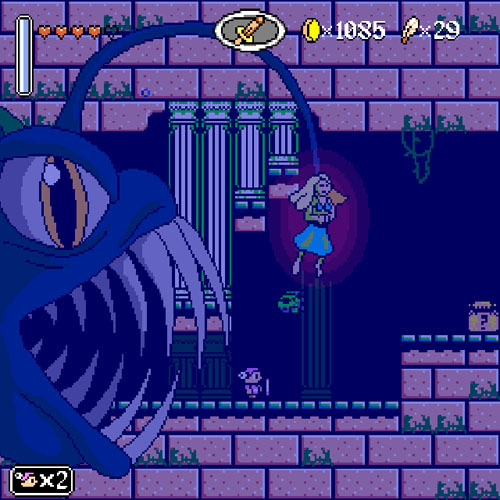 Going against the player’s instincts to save the maiden, Wing must attack her repeatedly while avoiding the fish as it jumps out of the water or charges in from the side of the screen. Another interesting fight takes place against a cartoonish floating demon head that glares in your direction. 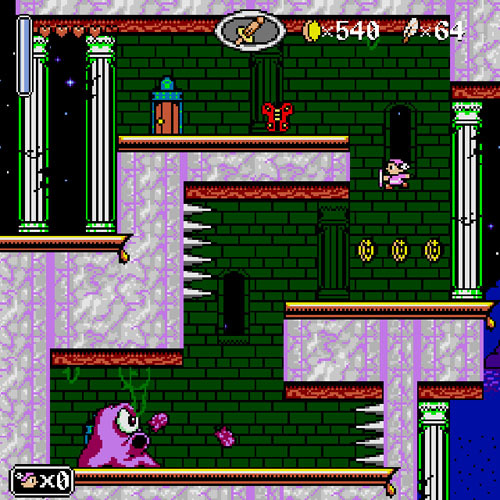 The head floats back and forth, opening itself up to attack, but after taking a few hits, the head disappears and bolts of purple lightning strike down on the player’s position. 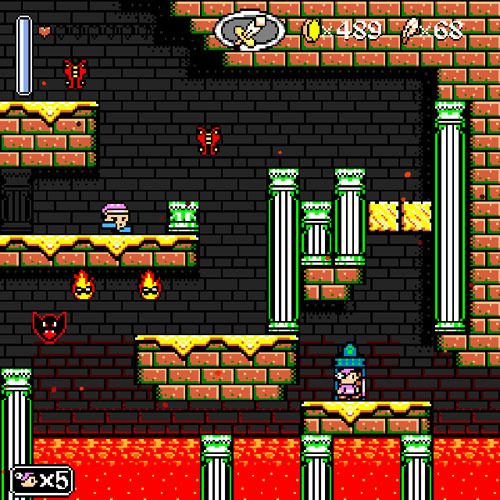 Avoiding these strikes requires that the player stay on the move and fly to avoid the lava below, as well as a pair of spouting fireballs (although these fireballs fail to respawn if the player is killed during the fight). 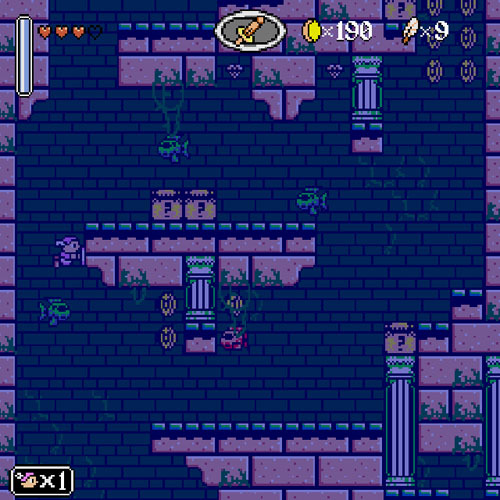 Players may be inclined to fight the demon from a distance, firing arrows from the safety of a distant platform. However, arrows do significantly less damage than Wing’s air dash attack, and the lightning strikes begin after every three hits, regardless of how much damage is done. So, while it is riskier, the battle is more quickly won if the player moves in for up-close damage. Toward the end of the battle, the lightning strikes appear more quickly and are more abundant, but they are no more difficult to avoid. 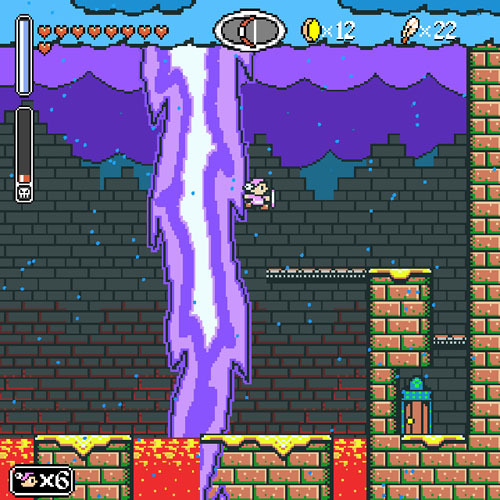 As the player makes his way up through the tower, he moves through a number of themed environments, beginning with the watery lower levels, before moving into lava and ice areas, and even into an entire village about two-thirds of the way up the tower. Higher areas are more fortress-like, but the player begins to see the night sky (presumably Wing’s ascent has taken a full day, as his journey begins in the sunlight) before facing off against each of the bosses once again, and eventually taking on the final encounter. 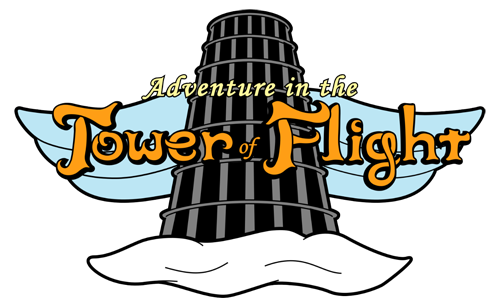 Adventure in the Tower of Flight was developed by Pixel Barrage Entertainment, a studio founded by John K. Manuelian in 2015. John previously worked for Creat Studios and Alliance Game Studios on such titles as Pinballistik and Alien Havok.